Hackers, cybernetic implants, neon signs, and non-stop rain. There’s more to the cyberpunk genre than rain-soaked future-cities, flying cars, and geishas winking from video billboards. The following games capture the essence of cyberpunk beyond just visuals, holding a cracked mirror up to our own society and sending us a warning from the future. And, well, they’re just really cool too. 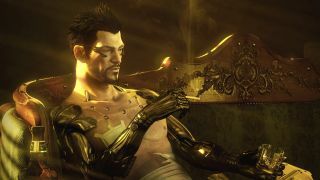 If your aesthetic is sulky, leather-clad hackers with cybernetic implants brooding in rainy, neon-lit alleyways, then you’ll get a kick out of these games as well. There’s something here for every kind of cyberpunk. Augmented government super-agent JC Denton gets tangled up in a conspiracy that threatens the future of the entire world, and takes it upon himself to bring the people responsible down. A peerless stealth sandbox with a brilliantly dark, paranoid story that takes Denton from New York City to Area 51. Rookie cop Ray McCoy hunts a group of rogue replicants on the grimy, rain-sodden streets of Los Angeles. An inventive point-and-click adventure game that riffs a little too heavily on the movie it’s based on, but gives you the chance to explore a gorgeous recreation of Ridley Scott’s influential dystopian city. Taking place in a city controlled by a sinister, all-seeing AI, this dark sci-fi mystery uses its dystopian setting to craft a brilliantly compelling and ever-twisting police procedural. Multiple playable characters, well-designed puzzles, and a rich story make this one of the finest modern point-and-click adventures on PC. Set in a dystopian vision of the city of Berlin, this tech-noir RPG features a rich urban setting to explore, satisfyingly tactical turn-based combat, and an array of different ways to play, whether you want to be an elite hacker or a futuristic samurai. Its unlikely blend of cyberpunk and high fantasy works surprisingly well. An early adventure by Broken Sword creator Revolution. Crash landing on a huge, sprawling future-city, hero Foster and his robot pal Joey have to make their way to ground level, witnessing a brutal class divide and a city ruled by a fascist police state. However, despite the grim premise, it has a very silly sense of humour too. Don't let the simple graphics fool you: this is one of the best systems-based stealth games since Deus Ex, with a surprisingly well-told story and big levels with many alternate routes. The city and its omnipresent CCTV cameras makes for an effective cyberpunk setting, even if your imagination has to do a lot of the work. An unlikely entry, but the seventh Final Fantasy is cyberpunk as hell: especially the grim, futuristic city of Midgar, where the impoverished live in dingy slums below the wealthy above. It gets less cyberpunk outside of the city walls, but the influence of artists such as Giraud and Otomo is felt throughout. When characters in cyberpunk fiction are tapping away at computers, this is what they're probably doing. An early game from DEFCON creator Introversion, it's a hacking/puzzle game with a really cool visual style. And if the art style’s a little retro for you, try the fantastic (and developer approved) Uplink OS mod. Set in a futuristic vision of San Francisco, this Snatcher-inspired point-and-click adventure tells a wonderfully heartfelt story, and stars an obscenely likeable robot sidekick called Turing. The colourful, vivid artwork, diverse cast of characters, and twisting plot make ROM an easy game to love. Probably the best of Bullfrog's Syndicate series, Wars is a tactical RTS set in a bleak dystopia ruled by evil corporations. The totalitarian status quo of the city is under threat from a virus, and it’s up to you to keep the populace from rebelling—usually through violence. Dark, but also satirical, it has a touch of Paul Verhoeven about it. A horror/FPS/RPG hybrid that would go on to inspire the much more well-known BioShock series. Set aboard a stricken starship, it's perhaps most famous for its sinister AI antagonist, SHODAN. There’s nothing more cyberpunk than an artificial intelligence gone rogue, and this is one of the finest examples of that on PC. Supergiant's follow-up to indie hit Bastion is one of the prettiest games on our list, but also boasts fast, kinetic combat, an engaging story, great voice acting, and a really amazing soundtrack. Cyberpunk doesn’t always have to be grey and drained of colour, as the vivid cityscapes of Transistor delight in proving. Eidos Montréal had a tough act to follow, but their take on the Deus Ex universe is fantastic. City hubs packed with missions and vivid world-building, a conspiracy-laden plot, and awesome augmentations (including punching through walls and turning invisible) make this a modern classic. Another dark, rainy cyberpunk point-and-click adventure from the esteemed Wadjet Eye Games, this time telling an intriguing tale of two characters in very different corners of a dystopian sci-fi setting. The understated, film noir-inspired atmosphere makes this a game you can really get lost in.